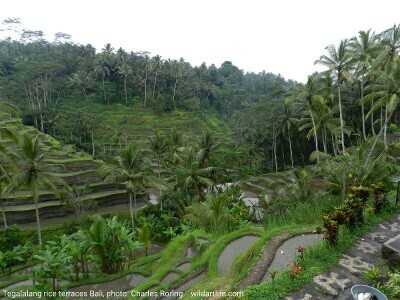 Here is the picture of Tegalalang Rice Terrace approximately half an hour ride to the north of Ubud. There are cafes and restaurant which visitors can go to enjoy the spicy Balinese food and see the panoramic beauty of the lanscape. Traditionally, Balinese people are agricultural society. They are hard working and diligent people. That's why we can see how the steep slopes of Tegalalang have been turned into terraces of fertile rice fields. While I was sitting at one of the cafes in Tegalalang, some children with postcards in their hands came to me and offered the postcards. The postcards have got pictures of Tegalalang rice fields, Ulun Danu Beratan Temple in Bedugul, Tanah Lot and several other places in Bali that have got wonderful scenery. One pack with ten postcards costs less than two US dollars. Most tourists who go to Tegalalang take pictures of the rice field and coconut trees using their camera and smartphone. They upload them into their facebook or twitter. There are also professional photographers who take pictures of the landscape for making calenders or large indoor house decoration. Very few artists also go there to make sketches of Tegalalang using graphite or charcoal pencils or water color. If we go further to the north area, we will reach Kintamani village that overlooks Lake and Mount Batur.